A few weeks ago, we hosted our first Strategy Leaders’ Breakfast in Boston where 15 senior strategy executives from the F500 in corporate strategy and internal consulting roles networked and shared the challenges their teams face across industries. The intimate environment allowed each guest to openly discuss the challenges, best practices, pain points, and opportunitiesfacing their teams. Portfolio managers are housed under the finance function and work in conjunction with the finance team. They tend to be large, diversified groups that have limited synergies and are mostly tasked with determining which businesses to invest in. Major conglomerates typically have teams that follow this model. According to the group, roughly 10% of teams use this model. 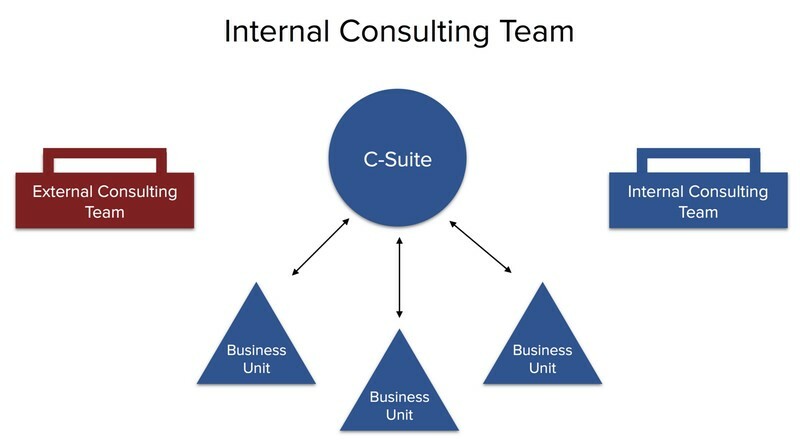 A standard internal consulting team supports other teams under a service agreement within the company. Similar to working with a top tier strategy consulting firm, this group will receive a project, run with it for a few weeks, and come up with a solution. The work request and deliverable will be billed back to the relevant business units. Approximately 25% of groups use this model. 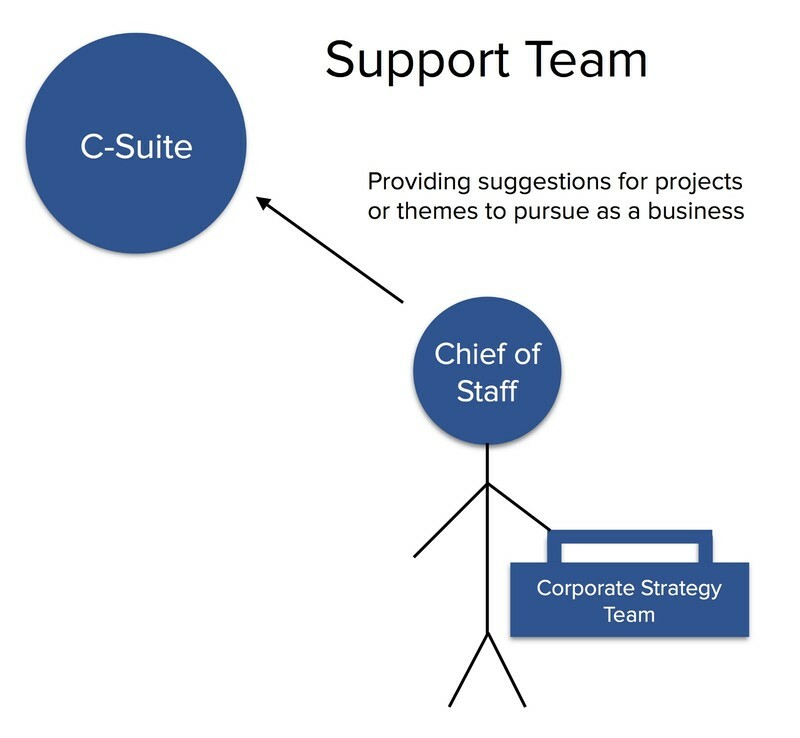 A special support team is often led by the Chief of Staff and is responsible for providing the CEO with suggestions for projects or themes to pursue as a business. While it’s argued that family-owned businesses lean towards this model, it’s also common among industrial companies. An estimated 20% of teams use this model. 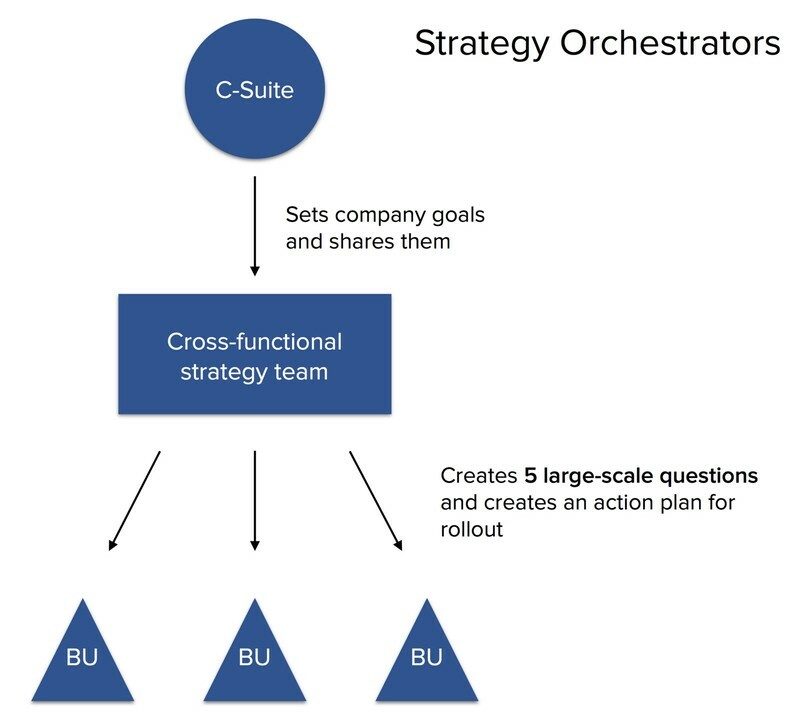 Strategy orchestrators are cross-functional teams comprised of 7–12 people that initiate the dialogue between business unit strategy leads and the corporate strategy leaders at the C-level. They’re often compared to the quarterback of the corporation, calling the plays the BUs make by posing 5 large-scale questions to the BU leaders that reflect company goals from the top down. From there, they work with BUs to determine an action plan for each group to implement in the following year. This is the most typical structure as approximately 45% of groups use this model. All four of the discussed models were represented, and each type of team leader expressed the challenges he or she face. Some leaders felt significant pressure to provide immediate value and to be taken seriously when CEOs position a strategy team as a cost-saving initiative — compared to bringing on a ‘Big 3’ consulting firm. They felt that this perception undermined the team’s offering and posed a major challenge to implementing change. It became clear that no single model is unanimously better than the rest, each team faces similar internal scrutiny regardless of company or industry. An analogy was introduced that I agreed was helpful in visualizing the issue — internal strategy groups prefer to be considered as bumper lanes in bowling rather than the guardrails on the side of the highway. The thinking is that bumper lanes save, support, and ultimately enable you to reach success instead of medians which typically halt progress. Struggling corporate strategy and internal consulting teams want to reverse any stigma associated with engaging them and to become thought of as a unique resource for their colleagues to use as a soundboard and bounce ideas off of. As is the case in many roles, there is a benefit to starting new strategy employees as generalists, with a strong sense of curiosity and hunger to add value. Naturally these people will begin to specialize, working on similar projects for separate business units and developing strong passions for certain capabilities. Eventually, individuals in internal consulting roles develop cross-functional expertise by having access into both the individual BUs as well as the enterprise corporate strategy and development. This gives them the skills necessary to effectively choose their next position and map their own trajectory. The largest obstacle to getting started as an internal strategy group is the skepticism that BU leaders will have when they’re asked to collaborate on a project. BU leaders may feel threatened by the internal strategy team’s objectives and attempt to determine the action plan with their own best interest in mind. Knowing that internal strategy groups should make it clear right from the start that they are on the same team and establish ‘bumpers’, can enhance performance. Many internal strategy teams will create 5 overarching questions that all segments of the company will operate within based on macro level trends impacting the company’s position in the market. For example, how do we appeal to millennials? How will Artificial Intelligence be incorporated into our business model? How do we incorporate IoT into our product road maps? By establishing these questions as guideposts or bumpers, businesses have the freedom to set their own strategy within this framework. Internal strategy teams should learn from people in other cross-functional roles. Knowledge is not held in totality by any one individual. Everyone can learn something from other people who have faced similar issues. We heard from this group of strategy leaders that finding the right person or people poses the greatest challenge. Whether it’s organizing time to connect with people in different BUs within your company, or utilizing tools like AlphaSights to connect with people outside of your internal network –it is essential to your success that you acknowledge opinions of people that are not directly looking at the same problem or might have a different perspective on the same challenge. We heard from several that groupthink was one hurdle to their team’s success. Alternative experiences and background might offer a solution previously unconsidered, or solidify assurance in your innovative hypothesis and ultimate suggestion. How do these findings relate to your team? Where do you see yourself fitting into this? As the above breakdown might not resonate with everyone in internal consulting or corporate strategy roles, I encourage you to get in touch so we can discuss how your team thinks about these topics.